I'll say this with no remorse, Divergent > The Hunger Games. For whatever reason I really like this movie series more than I like the Hunger Games. I mean I'm not exactly a fan of splitting movies up into two parts when really it should just be one solid part. 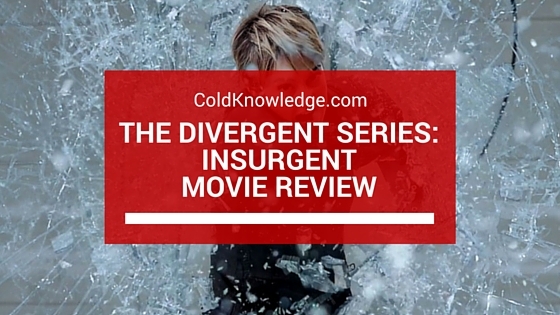 But Insurgent hits on all of those points that The Hunger games did when it first came out. The story is more sci-fi for me, and that's a plus, and the visuals are just as awesome. The other thing about this movie is that it doesn't hold back from the gruesome details of which it strives to hit on when coupling it with it's dystopian theme for the future. The cast is on point and they all carry their respective roles pretty well, they don't waste too much time developing characters that aren't essential to the plot. And even with doing that, they still manage to let you know that there are characters that still matter, even though you don't see them as often. That's always a great setup for when there are big moments when those other characters come through when you least expect it. I'm not really going to talk too much about the movie because it's one of those it's better to see the film than it is to talk about it, but I would definitely recommend it to those who like to watch movies with a solid plot and action to accompany it. If you have the patience to watch a movie develop, then this is for you. I think the cause bang bang, shoot'em up audience will also like this movie if given the chance. They're also giving the last film in the series the split up treatment, so we'll see if they can do better, to me, than what The Hunger Games did. Have you seen this movie? If so, how did you like it overall? Leave it in the comments below.